Gen Xtinct: Funky Food Friday: Who ate all the Frusen Glädjé ? Funky Food Friday: Who ate all the Frusen Glädjé ? Heh, remember Frusen Glädjé ? It was truly an 1980s product, invented in 1980 with a fake Swedish name and some random accents, and sold to Kraft in 1985, where it disappeared into the void. This article (complete with buxom ice-cream princess) says "A Kraft spokeswoman states that Kraft sold its Frusen Glädjé license to the Unilever Corporation in 1993. 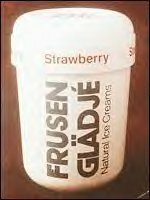 A spokesman for the Unilever claims that Frusen Glädjé was not part of the deal. The brand has all essentially disappeared." We remember it being pretty good, coming in simple domed white containers, and having annoying ads where people confessed their guilt (to priests, therapists) over eating all the Frusen Glädjé. But there's two real guys at Ben & Jerry's!" During the 80's people had a love for all things Swedish (Volvos, Swedish Fish, etc.) It seemed that Frusen Glädjé disappeared as soon as word got out that it was -- horrors -- an American product with a bogus name.